Jacqui selected 2 fabrics. 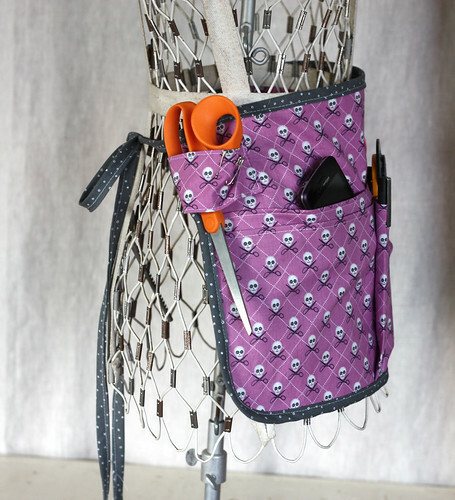 Michael Miller Fabrics Quilt Pirates Lavender and Timeless Treasures Knitting Dots Grey. Jacqui made the apron according to the directions. She found attention to detail was important for correct construction. 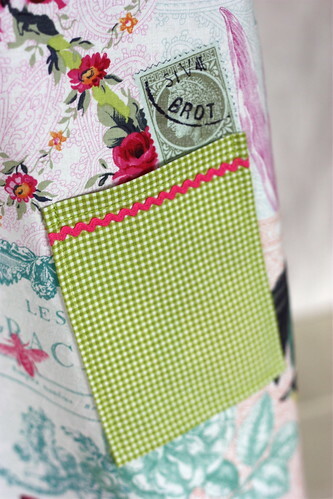 She created her own bias binding using a contrasting fabric…so cute! 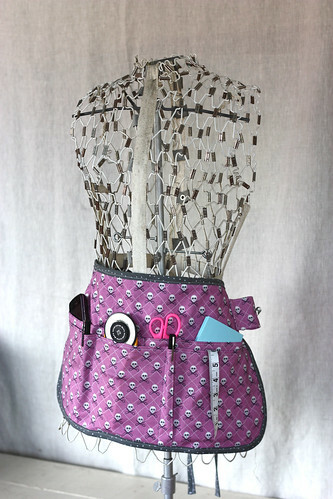 Jacqui had two concerns for this project – would the upper apron pocket be too shallow? Would the apron straps be too narrow? Neither was a problem. In fact, she loves the shallow upper pocket. It’s perfect for holding her cell phone. The tie straps also did not bother her once the apron was on. 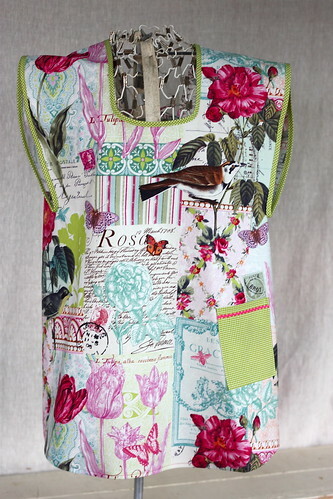 If you prefer wider straps, you can borrow the instruction’s from the Granny’s Clothespin Apron on page 51. Jacqui discovered a correction in the final dimensions of the apron. It should be 21 inches wide instead of 23 inches. Jacqui absolutely loves the practicality of this apron for work. The pleats on the bottom pocket made perfect pen holders. Be sure to use caution if you put cutting tools in your pockets (sometimes it just makes a pretty picture). The armholes are created by slashing the fabric from the top edge down to a marked point on the pattern. Bias binding is used to finish the edge. Kathy enjoyed learning this new technique. Kathy made her own bias binding from the new Michael Miller Tiny Gingham. She loves this fabric and wants to bind everything she makes with it. Kathy liked the overall design of the smock but found she needed more ease through the chest area. If she made the pattern again she would move the end point of the armhole toward the back of the smock about 1.5 inches on both sides and re-draw the slash line accordingly. This would create more room across the chest and make the bottom of the armhole perpendicular to the shoulder seam. The tie placements were too high, pin first and make sure you can tie them yourself. 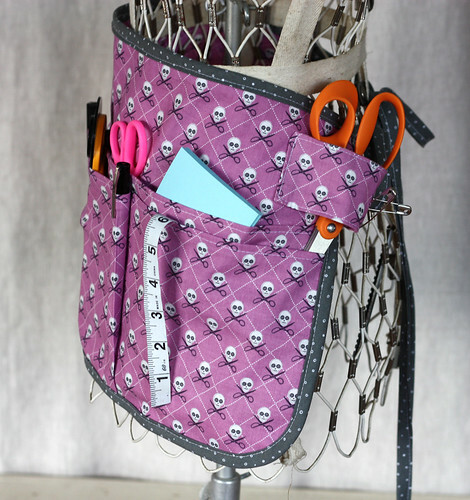 The pattern layout is based on 44″ inches of useable fabric (not including the selvage). Most quilting cottons are 44″/45″ wide including the selvage. If the fabric is pre-washed and shrunk it will reduce the useable width even more. Kathy did not have enough fabric to cut out the ruffle or the ties as illustrated in the pattern. She cut the 2″ ties crosswise vs. on the grain and they worked just fine. 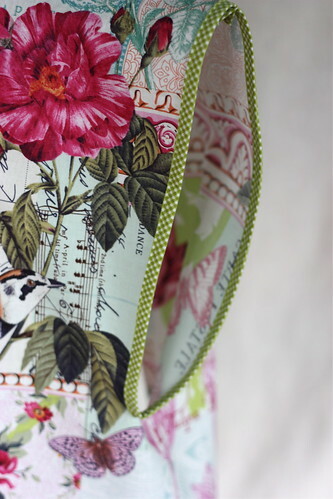 The neckline was finished with additional bias binding. Trim the 1/2″ seam allowance at the shoulder seam if using this approach. Please note that the text for the BODY pattern piece is upside down.